Please come dressed exactly as you intend to be for the graduation ceremony. 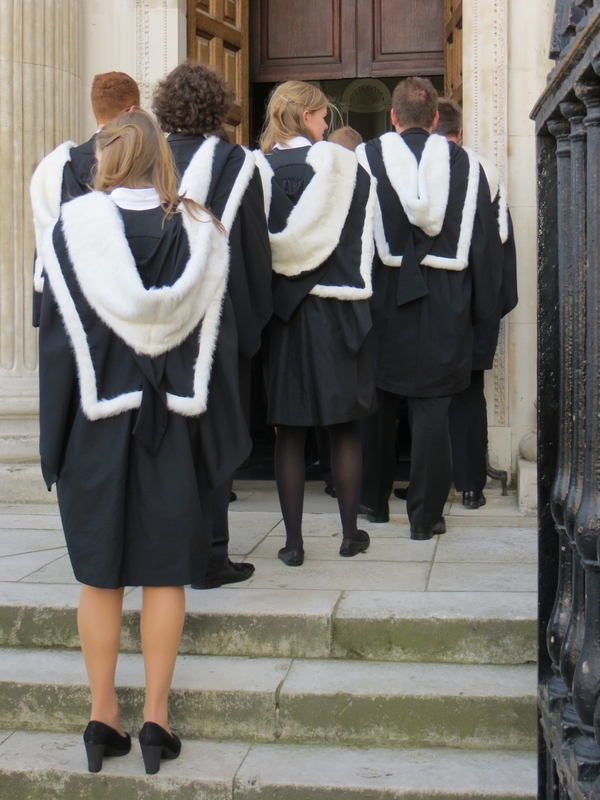 The Praelector and Tutorial staff will check that your dress is correct and help you to adjust your gown and hood so that they stay in place. Please bring a few safety pins with you if possible. Please also bring your University card, as these must be surrendered (sob!). 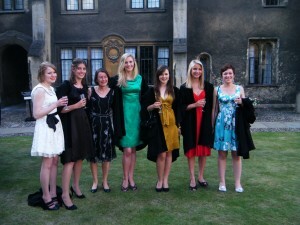 You’ll get tickets for your guests to get into both the Senate House and the Master’s Buffet Lunch in exchange for it. It is essential that your guests have these tickets so please don’t forget! Once your dress has been passed as correct, you will assemble in alphabetical order in Old Court (or the chapel if it’s raining) for the group photo. This will be available for purchase from the Porters’ Lodge on the afternoon of graduation day. Dress for the dinner is Black Tie with gowns. Dinner begins at 7.30pm and is preceded by a drinks reception. At the end of the meal itself, before leaving Hall, the legendary Horn will be passed round and all will drink from it. After dinner drinks will follow in the marquee on New Court. Please ensure that you are in Old Court, fully dressed for the ceremony, at 10.50am. The Praelector will address you, and will then conduct a short rehearsal. Your guests are welcome to watch the first part of this, but will need to leave College in time to make their way to the Senate House before the doors close to guests at 11.55am. After the rehearsal, it will be time to line up for the procession to the Senate House. The Head Porter will lead the way, resplendent in morning suit and top hat, and wielding his knobstick. You follow behind, along with any Fellows who wish to attend. 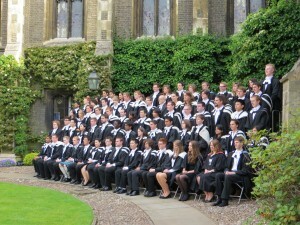 Look up into the balcony when you arrive, to see other familiar faces from your days at Corpus. There are more details of how the actual ceremony works in ‘Ceremony’. You will already have pre-booked your tickets (£10 each) for this via CamSIS when you applied to graduate. Food will be served in the marquee in New Court. Please take your guests to visit the Master’s Lodge and Garden at some point during the afternoon. Tea, coffee and soft drinks will be available there. It is advisable to pre-book a time via the link Jan sent you by e-mail; ask her if you can’t now find it! However, you can just turn up and wait for a vacant slot if that’s easier. 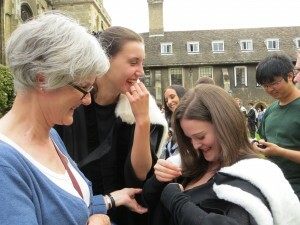 The photographers will be in New Court if it’s nice weather, or the Master’s Lodge if it’s wet. An exhibition of manuscripts will be held in the Parker Library, with plenty to interest you and your guests. An exhibition of the finest of the College silver will be held in the Spencer Room. 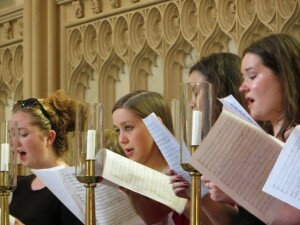 You and your families and friends are warmly invited to the optional Graduation Service in the College Chapel. After the celebrations, you are free to do as you wish. Some people will have booked an evening restaurant meal for their family party, others prefer to chill out in college, some will pack up their belongings and go straight home.